Remember a LONG time ago WeAllSew had directions for Sandi’s Holiday Runner? (July 9, 2013…I looked it up.) And they said to send pictures? Well . . .
We just had a class and I am sending pictures. We had a great time using the BERNINA Circular Embroidery Attachment #83 to EASILY make this Drunkard’s Path WITHOUT curved piecing . . . yeah! Still need to add borders. Or maybe not. Here’s a close-up of the circles, which are appliqued to squares using a circular embroidery attachment and then cut into halves and quarters – so much easier than piecing! Close-up of Drunkards Path block. 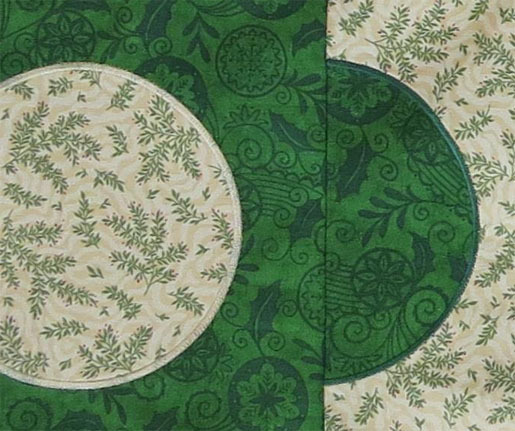 Note the satin-stitched edges of the circles. Esther made the aqua one. Jamie made the blue and white one. I made the green and cream one. Next Next post: Easy DIY Quilt Hanging Sleeve – Almost Entirely by Machine!